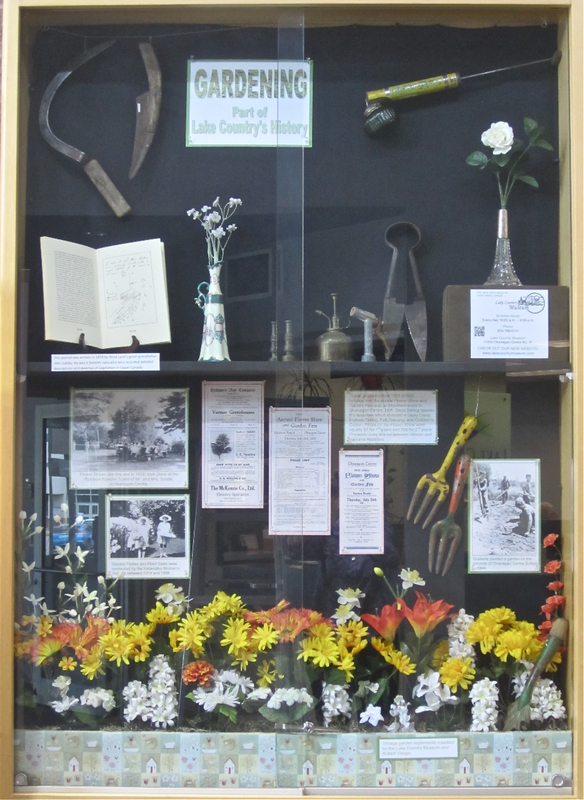 The new display mounted at the District of Lake Country municipal offices coordinates with Communities in Bloom. The display case highlights Gardening, Part of Lake Country’s History. Museum artifacts on display include a hand sprayer by Green Cross, two hand scythes, shears, and two vases. Other vintage garden implements are courtesy of Robert Verigin. A copy of the journal written in 1819 by botanist John Goldie is displayed. John Goldie was the great-grandfather of local resident, Anne Land. Programs from the Women’s Institute Flower Show and Garden Fête 1926 and 1928 demonstrate the long history of interest in gardening. Local plant sales and flower shows date back to 1914. One of the photos shows school children planting a garden in 1944 on the grounds of Okanagan Centre School. This informative display was mounted by Museum volunteers Karen and Glen Gibbons.